Raúl Leoni is a municipality at Bolivar State. 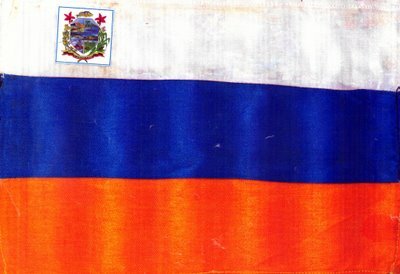 Photo of its flag at <rleoni.blogspot.com>. The flag is white-blue-red horizontal triband with the municipal arms at the canton..
WHITE STRIPE: represent the purity of the inhabitants of the Municipality, because they are dedicated to the creator work in diverse areas. DARK YELLOW STRIPE: represent the diverse minerals which are into the Municipality". This is to say, the inferior stripe is dark yellow not red. General information in Spanish (no English Wikipedia page at the moment). Though the image surely shows the bottom stripe in red, only slightly orangish, the text in the mentioned blog post says that it is rather ochre yellow, standing for mineral ores; blue, by the way, stands for the sky and for local rivers and lake Guri, and white the locals purity. Official site is <raulleoni-bolivar.gob.ve> , but its page about the local flag shows the photo of a flagless facility. The "Coat of Arms" emblem is shown. The emblem seems to be centered on the hoist side half of the white stripe.